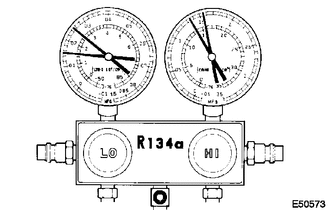 This is a method where a manifold gauge set is used to help locate the problem. Temperature at the air inlet with the switch set at RECIRC is 30 to 35°C (86 to 95°F). The engine is running at 1500 rpm. The blower speed control switch position is at "HI". The temperature control dial position is at "COOL". The A/C switch is on. The ignition switch is in a position that enables the A/C compressor to run. (2) Moisture is present in the refrigeration system. (5) Refrigerant does not circulate. 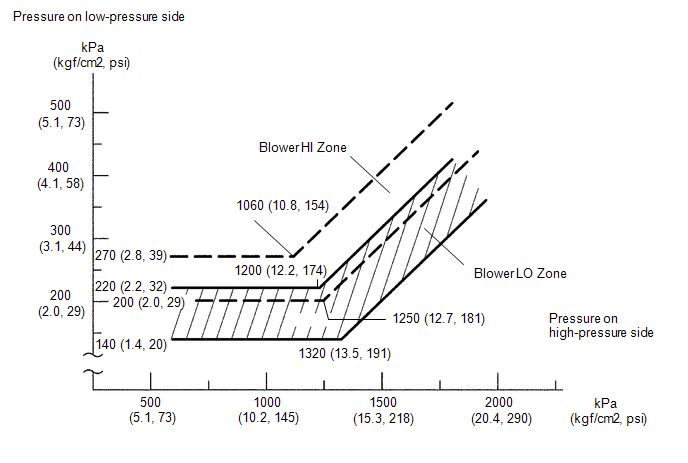 (6) Refrigerant is overcharged or cooling effectiveness of condenser is insufficient. (7) Air is present in the refrigeration system.